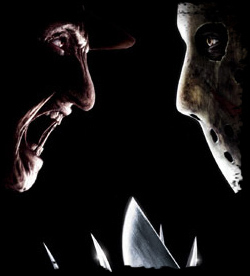 Robert Englund reprises his role as the famous dream stalker, Freddy Krueger, who joins forces with fellow horror maven Jason Voorhees to create a new reign of terror on Elm Street, but the collaboration soon turns into a nightmarish face-off between the two. Ronny Yu (Bride of Chucky) directs this long-awaited battle and Freddy vs. Jason also stars Monica Keena (Orange County), Kelly Rowland (Grammy-winning music group Destiny’s Child), Jason Ritter (Swimfan, TV Series Joan of Arcadia), Christopher George Marquette (The Tic Code) and Lochlyn Munro (Scary Movie, A Guy Thing). US: The Ultimate Battle of Evil vs. Evil. UK: Even a Killer Has Something to Fear.